- "The Scarecrow of Romney Marsh: Part 1"
- "The Scarecrow of Romney Marsh: Part 2"
- "The Scarecrow of Romney Marsh: Part 3"
-- Introduction with Leonard Maltin (3 min). Maltin gives a brief introduction to the renewed aspect ratio of “Dr. Syn” that was originally filmed in 1.66:1, giving credit to the re-mastering crew in putting together the renewed features. An interesting discussion of the aspects of Disney’s DVD production crew. -- “Walt Disney TV Introductions In Widescreen” (5 min). This featurette is simply a compilation of the Walt Disney introductions before each episode, but presented in the 1.66:1 widescreen that the rest of the feature is presented in. -- “Dr. Syn: The History of The Legend” (16 min). 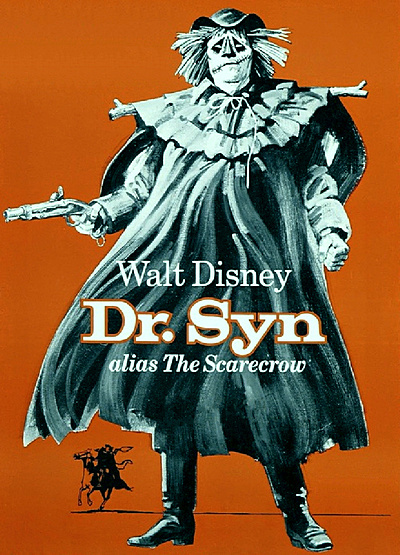 This featurette deals with the legend of Dr. Syn, talking with historians, like Disney historian Bryan Sibley, along with writers and others who go through the history of the novelization of Dr. Syn, as well as talking with the recently deceased Patrick McGoohan. -- Introduction with Leonard Maltin (3 min). Maltin talks about the feature length restoration of the film, discussing the other two versions of the film not produced by Disney and what makes this miniseries and film so distinct. Maltin does a good job of talking about the distinction between the miniseries and the film, as well as giving an interesting history of the actors within the production. -- “Walt Disney: from Burbank to London” (12 min). This final featurette deals with Walt Disney’s travel to England to produce films following the second world war, discussing the financial and personal reasons the Disney company expanded into London along with Disney’s obsession with Live action films.